A man being taken away in handcuffs after the boat was stormed. File photo. 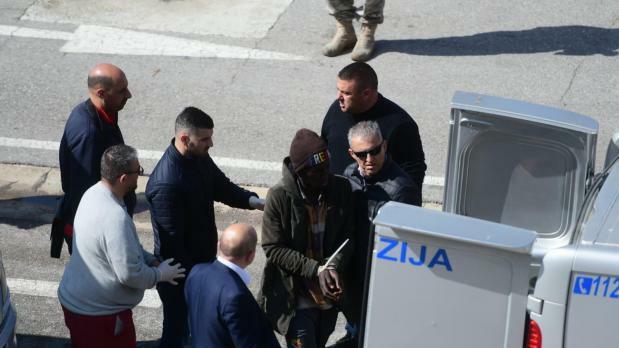 A Magistrates’ Court has declared that there were sufficient grounds to place three teenage migrants, currently accused of hijacking the merchant vessel El Hiblu 1 which had rescued them at sea, under a bill of indictment. The youths, aged 15, 16 and 19, two from Guinea and the other from the Ivory Coast, are currently facing charges amounting to terrorist activity, their alleged acts punishable with a possible jail term of between seven and 30 years. The three are the suspected ringleaders who had hijacked the vessel, forcing it to change route to Malta rather than proceed on its journey to Libya upon realising, at daybreak, that the vessel was approaching the Libyan coast, contrary to what they had been promised. During last week’s hearings, the court, presided over by magistrate Aaron Bugeja, had heard the Turkish captain of the El Hiblu testify as to how the suspects had behaved aggressively at the helm of a larger group of migrants who had circled the bridge, instructing the captain to “Go Malta!” at full throttle. The El Hiblu 1 was stormed by AFM troops in the early hours of March 28 as it entered Maltese waters. As the case continues, the court ruled, on Monday afternoon, that there was enough evidence for the men to be placed under a bill of indictment. Inspector Omar Zammit and lawyer Nadia Attard from the Office of the Attorney General are prosecuting. Lawyers Malcolm Mifsud, Cedric Mifsud, Neil Falzon and Gianluca Cappitta are defence counsel.